This unusual name is the vernacular form of the female personal name 'Agatha', the 'learned' (because classical) form in the Middle Ages. The derivation is from the Greek 'agathos' and means 'good (woman)'. The first known Agatha was martyred in the 3rd century and her miraculous veil, in the church of Catania, in Sicily, is believed to be a sure defence against the eruptions of Mount Etna, so it is fitting that St. Agatha is the patron saint for protection from fire. The name was popular throughout Europe during the Middle Ages usually as the French 'Agace' or Latin 'Agacia'. In the modern idiom the surname can be found as Agass, Aggas, Aggass, Agiss, Aggiss, Aguss and Agguss. One Thomas William Aggiss was christened at Christchurch, Southwark in London on the 2nd August, 1835. 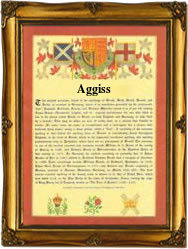 The first recorded spelling of the family name is shown to be that of Roger Agace. which was dated 1275, The Subsidy Rolls, Worcestershire. during the reign of King Edward I 'The Hammer of the Scots' 1272-1307. Surnames became necessary when governments introduced personal taxation. In England this was known as Poll Tax. Throughout the centuries, surnames in every country have continued to "develop" often leading to astonishing variants of the original spelling.